Convenient, adjustable and portable for safe injections; includes shielded Multi-Syringe Holder. The Injection Stand allows fast, comfortable arm positioning for radionuclide injections. The clear plastic armrest rotates 180° facilitating convenient angling while the cradle design holds the patient's arm firmly in place. 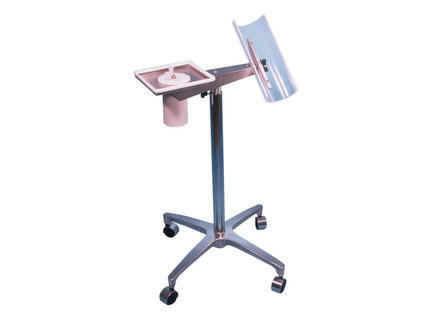 A utility tray sits adjacent to the armrest to place various supplies and includes a shielded Multi-Syringe Holder, which accommodates up to four syringes. The stand is height adjustable to accommodate patient comfort. Smooth rolling casters allow the stand to roll easily into position or out of the way for storage when not in use. The stand is structurally balanced to help prevent tipping.